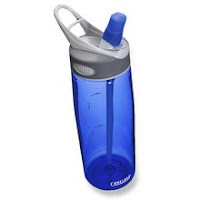 *CamelBak® convenience comes to popular water bottles for the benefit of anyone in need of quick hydration. Did you see that part about the "bite-valve"? It's awesome. The kids just bite on the blue part and the slit opens up; then it works just like a regular straw. As soon as they release their bite, the slit closes again and prevents leaks. 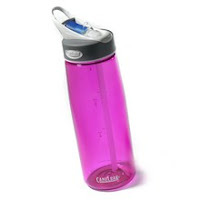 It's polycarbonate, so it doesn't absorb odors and make the water taste funny. Holly Grace (a.k.a. the "midnight waker") likes to keep one on her nightstand and sometimes sleeps with it in the bed with her. It never leaks. And that blue thingy can be replaced if need be.